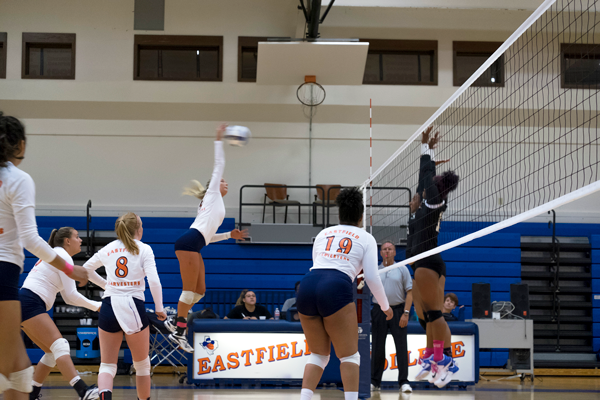 The Eastfield women’s volleyball team clinched the Metro Athletic Conference regular season title for a second consecutive year after sweeping Cedar Valley College on Monday. With the win, they earned hosting rights for the conference tournament Oct. 25-28. The first round of the tournament will be played Oct. 25 by the seeds ranked No. 3, 4, 5 and 6, with the winners of each game reaching the semifinals. The Harvesters bypassed this round and advanced directly to the semifinals on Oct. 27. They will play against the lowest remaining seed, while the No. 2-ranked seed plays the highest remaining seed in the other semifinal. The championship game will be held the following day, Oct. 28, at noon. The Harvesters, who are No. 3 in the national rankings, still have two conference games remaining in the season. They visit Richland Thursday and will end the regular season by hosting North Lake Oct. 23. The Lady Harvesters will try to finish the season undefeated for the second year running. Last year, they won the regular season by winning every game and only dropping five sets throughout conference play. This year, the team has yet to lose a set against conference opponents and hope the season with a perfect record.